Dhuwan Dahi Qeema recipe by Marium Marghoob at DesiRecipes.com. This is a traditional Pakistani recipe of making dhuwan dahi Qeema. Its delicious, spicy and yummy..... It tastes amazing with garnishng. All garnishing ingredients should be finely chopped and as per you need. 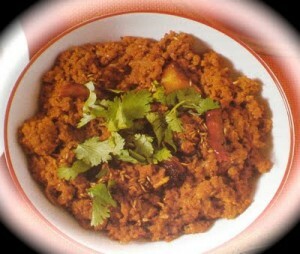 Mix the ingredients into keema except for oil, onion , zeera and baisan and allow it to merinate for 2 hours. Now roast baisan and safaid zeera on a tawa saperately. Set it aside, pour oil in a pan and allow it to hot them fry onion till it gets pink. Pour marinated keema in that, stir and mix it. Allow the water to get dried. Now pour roasted baisan and safaid zeera in it and allow to cook for 2 minutes. Turn the heat off and give it a barbq smell by putting hot koila on it and pour some drops of oil on koila. Put the cover imediately over the Pot to infuse the smoke. Garnish it with the ingredients given above for it. Serve hot with rotis, naans or parathas.you will defenitely love it. so delicious & yummy. my husbnd like it thanks 2 share this receipie.